A call to Peter Thompson at Worth Avenue Yachts brings news that he'll be hosting an Open House aboard the 57.9m motor yacht Mi Sueno on June 28 at Monaco's Port Hercule from 5pm. Delivered by Trinity Yachts in early 2010, she’s a modern combination of the latest marine technology and exquisite styling. She sleeps 12 guests in six lavish staterooms and has the added benefit of wheelchair access. ABS-classed and MCA-compliant, Mi Sueño was designed with a transatlantic range, but also has a draught suitable for cruising The Bahamas and US East Coast. She has a maximum speed of 20 knots and a range of 4,000 nautical miles at 10 knots. 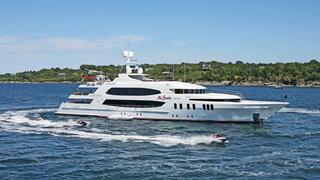 Mi Sueño is asking $39.95 million.